Feeling right at home doesn’t mean sacrificing the look of your interior. It can still be modern, classy and even a little bit sassy! 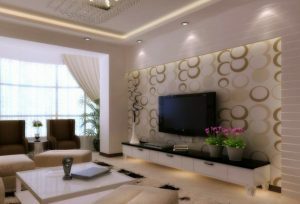 Take a look at this brand new beautiful living room. The design doesn’t scream at you, but the wallpaper plays a visual trick and pleases the eye!